Elastic waistband. Straight leg. Flat front. 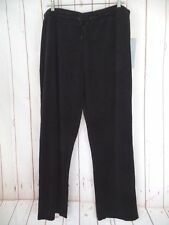 Onque Sweat Pants, Plus Size 2X, Black Velvet. Cotton poly stretch blend velvet stretch pants. Drawstring waist. Plus Size Comfy! DESIGNER AND CONTEMPORARY APPAREL SIZING. Inner label has been cut. Pilling on clothing is subjective. Onque Sweat Pants, Plus Size 2X, Black Velvet. Cotton poly stretch blend velvet stretch pants. Drawstring waist. Plus Size Comfy! DESIGNER AND CONTEMPORARY APPAREL SIZING. Pilling on clothing is subjective. SIZE: SMALL INSEAM 24". COLOR: BLACK. Type of Clothing: Capri Pijamas. Color: Blue White. We strive to provide the best possible purchasing experience. These pull-on pants feature side slash pockets, and relaxed straight leg. Bottom leg opening is approx 8.5" across laying flat. Onque Casuals. Applique Giraffe Multi-Colored Designs. Capri Pants. Regular Size L - 16. Inseam - 23". Good Pre-Owned Condition. NWT - ONQUE CASUALS ladies pretty yellow sweat/lounge/jogging/athletic pants with pockets - sz PXL - Approx. NWT - ONQUE CASUALS ladies pretty yellow sweat/lounge/jogging/athletic pants with pockets - sz S - Approx.